For a few weeks now, I've been using the try plane that I built and absolutely love it. This thing cuts like a dream! But I noticed a little problem when I was taking full width shavings from a 6" wide plank of (what I think is) sapele. This wood has ribbons of reversing grain and the shavings were not coming off as long, intact shavings, but rather as very small (1/4" x 1/4") chips. Whether or not the shavings were the reason, I was getting some clogging in the corners of the mouth. I'd been thinking about this for a while and decided to take a closer look at what's going on. The following picture was taken during the build. Forward of the abutment recess, the sidewall of the plane's throat is vertical. starts receding into the body. Definitely a pinch-point where shavings could jam. 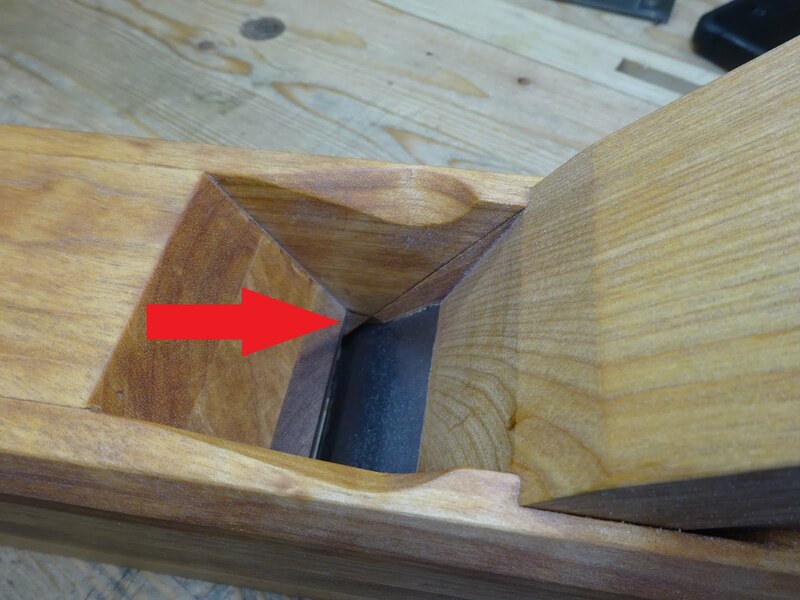 My hope was to pare away a little wood below the pencil line at the same angle as the point of the wedge. I gave the plane a try on some sapele after this and there was no clogging. Time will tell if the plane will handle all woods and all types of shavings. But for now, it looks good. This is one of those tiny details in plane design that you can't seem to figure out unless you go through it yourself. Those old plane makers sure did know their stuff! This is really a nice plane. I need to restore my great grand father try plane to get it back to work, another project on the list. I will need to make a new wedge and find an cap and iron assembly. Your post will be of good information for me. Thanks, Lionel. When you do get a chance to bring that plane back to life, (if you're like me) the feeling you'll get when using it is amazing. I love using this plane. I found my iron/capiron at a tool show - if you have any old-tool organizations in your area, that's a great way to find old irons. And you can look at them and inspect them before buying, which is nice.